Mix the vinegar, sugar, salt and spices together; marinate pork up to 4 hours. Heat grill to medium heat. Brush the pork with olive oil and place on grill. Cook for about 15 minutes, turning each side 90 degrees to make a crosshatch pattern. Note: internal temperature should be about 150-155°. Transfer pork to cutting board and let rest about 8-10 minutes. 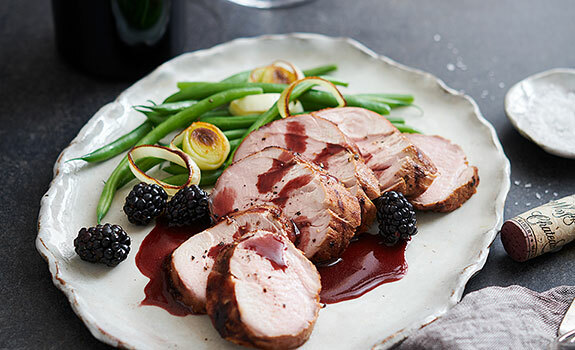 Slice and serve with blackberry sauce. Heat a medium saucepan over high heat and add olive oil. Stir in garlic, shallots, carrot, and celery; reduce heat to medium-high and sauté until the vegetables begin to brown and caramelize, about 5 minutes. Add Chateau Ste Michelle Cabernet Sauvignon to deglaze the pan, stirring well. Stir in stock, blackberries, jam, and balsamic vinegar. Bring the mixture to a boil, then reduce the heat to medium and continue cooking until the liquid is reduced by half, about 30 minutes. Strain sauce and return to pan. Bring sauce to a boil over high heat; reduce heat to medium. Cook until liquid is reduced by half and thickened. Season to taste with espresso, salt and pepper.